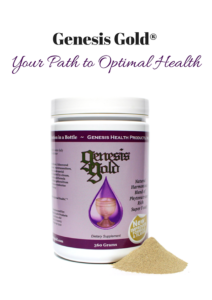 Do I need a consult to determine if I should start with Genesis Gold® or Sacred Seven®? No, you do not need a consult to determine which product is best for you. Genesis Gold® is the foundation formula that includes whole foods naturally rich in micronutrients including vitamin, minerals and antioxidants, adaptogenics herbal blend, digestive support, detoxification support, and complete neuro-immune-endocrine support plus the Sacred Seven® amino acids to optimize hypothalamic function (The hypothalamus is the maestro of the entire neuro-immune-endocrine system). I recommend Sacred Seven® amino acids, in addition to Genesis Gold®, if you have depression, anxiety and/or want to get off medications for these disorders, a learning disability, severe hormone depletion symptoms likely newly menopausal, autoimmune thyroiditis or food allergies and may be sensitive to the whole foods in Genesis Gold® After 2-3 months on Sacred Seven® alone, the hypothalamus balances enough to decrease hypersensitivity, Genesis Gold® can then be taken.